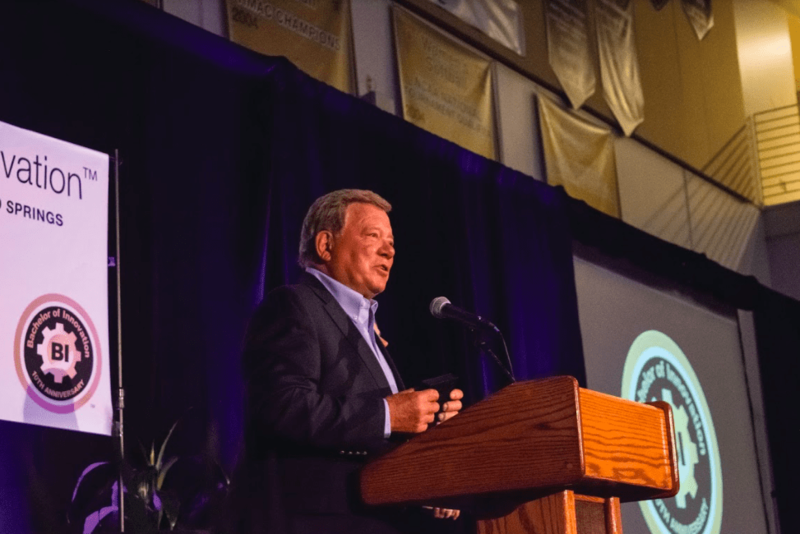 William Shatner, famous for his role as Captain Kirk in the “Star Trek” series, looked to inspire students to make innovative change at the Bachelor of Innovation’s 10th Anniversary Event last week. A crowd of 400 students, faculty, staff, alumni and donors gathered on April 19 to hear Shatner, who served as the keynote speaker, give a 40-minute speech on “Hope and Innovation.” Shatner discussed technological advancements, global warming, manufacturing and why human nature needs to change. Spinphony, a four-piece string band, played renditions of pop songs as guests dined before the speech. Tables seated 10 attendees, with at least one spot reserved for a student in the Bachelor of Innovation program. Hilary Billings, a writer for USA Today and Miss Nevada U.S. 2013, served as the master of ceremonies for the event. Mayor John Suthers, Chancellor Venkat Reddy, Chancellor Emerita Pam Shockley-Zalabak and Sue Sharkey, chair of the CU Board of Regents, were in attendance. Billings recognized several BI students for their innovations, including Abby Graese, who received a scholarship from Notre Dame; Bailey Wilde, who is one of the top-ranked Apple Store geniuses in the world; and Preston Hare, the founder of Lot Spot, a vehicle tracking app that launched in 2014. Reddy introduced Shatner by discussing the creation of the BI program in 2007 and commending Shatner for “Star Trek,” a show that he “eagerly looked forward to” as a child. “I cannot believe the man I admired on TV is now with me onstage in real life,” said Reddy. 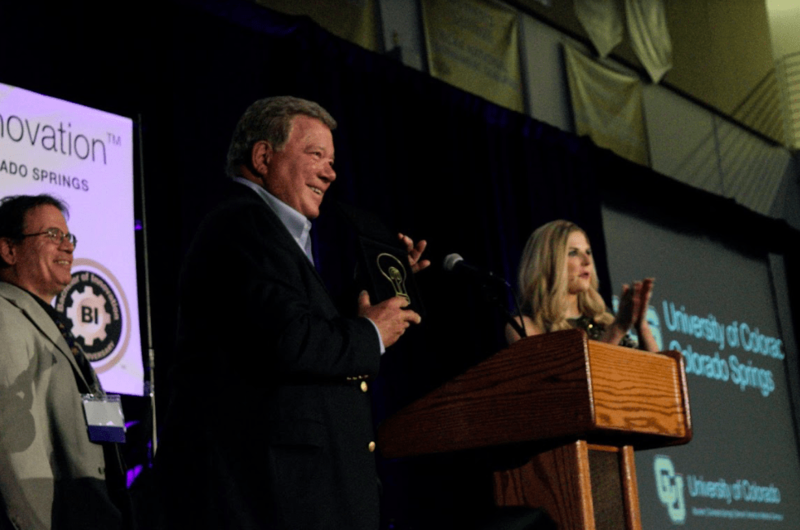 Shatner continued to relay back to this generation of students as being the conductors of change, and that students are the beacons of light for the future. Shatner believes that these innovators are those that will seek change and make it a reality. Shatner talked about inventions that have changed how the world works and the possibility of new inventions that will sustain human life and our planet. “The real world is both beautiful and ugly. You can see the beauty from the windows of the university far more easily than the slums of the city. You can see the beauty of pure learning, the theoretical possibilities, the cleanliness of democracy from the hallowed walls far easier than the grimmy corridors of life downtown. But there is also another side to life, and to me that aspect is hope,” said Shatner. Shatner began to talk about human nature being the outlet for change. Relationships and interactions are areas that Shatner believes need to be examined. “The change we need to make is human nature,” said Shatner. He also discussed social media, the great impact it has on our generation and how people can utilize it in a more positive way. “There are things being said on the social media that are being said that no human being would want to take responsibility for,” said Shatner. 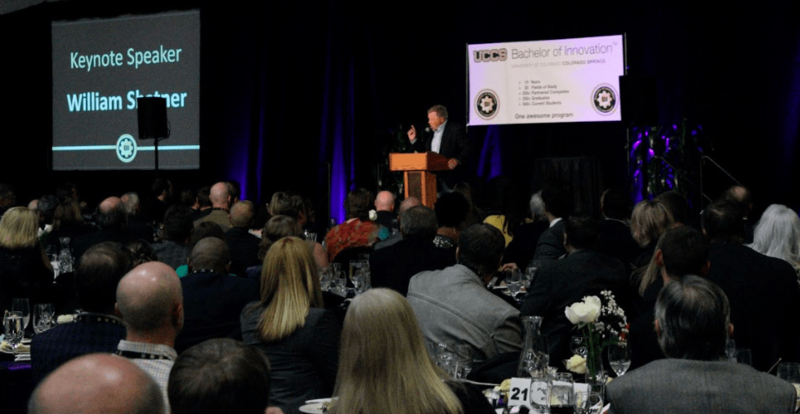 When Shatner concluded his speech, Terry Boult, El Pomar Endowed Chair of Innovation and Security, College of Engineering and Applied Science, was invited up to the stage along with Nina Polok, executive director of the Bachelor of Innovation. Both professors were presented with awards for their contributions and recognized for being the founders of the Bachelor of Innovation program. Boult and Polok were each presented with a plaque from Shatner. Boult presented Shatner with a BI Bold award to show appreciation. The award was created by Rodger Steven, a New York City artist, who made the award a light bulb, symbolizing the birth of innovation with the this invention of Thomas Edison’s. “There lies, just beyond our fingertips, the mystery of life. A universe of contemplation. We have no idea of anything, merely glimmers of possibility. 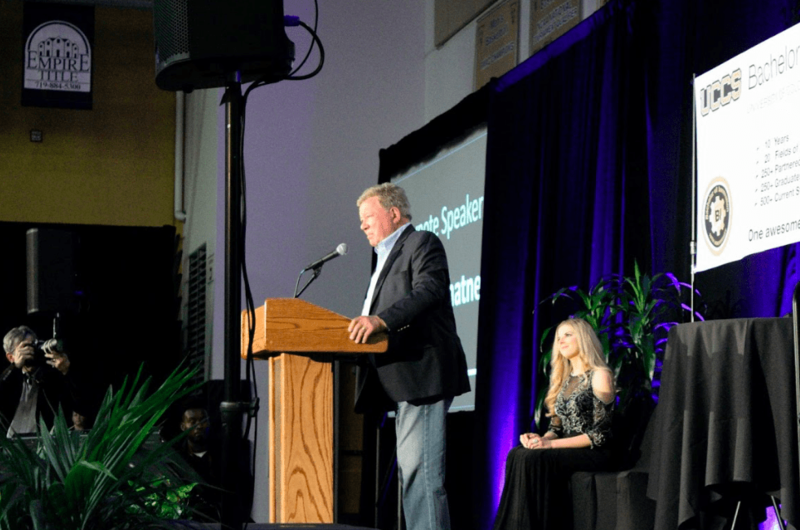 It’s up to you students to explore those worlds,” said Shatner.